Transition US is delighted to be part of the second cohort of national Transition hubs (along with Brazil, Mexico, Germany, and Portugal) to be receiving mentoring and support from Transition Network to bring REconomy to our country. 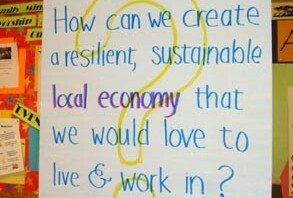 We believe REconomy provides an important complement to the diverse, innovative work to build just and regenerative economies that is already happening in communities across the US. From cooperative development and local investing to “anchor institutions” and dismantling the prison-industrial complex, the depth and breadth of “new economy” work happening in the US is truly inspiring. 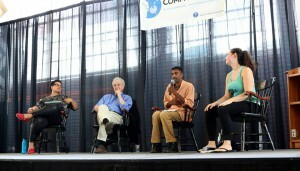 Leading up to the conference, I had the opportunity to work with colleagues from Post Carbon Institute and Conversation Collaborative on a project to “weave” the community resilience and new economy movements in the US through a series of appreciative inquiry interviews and group conversations with dozens of leaders in the new economy movement, as well as through a participatory workshop at CommonBound. 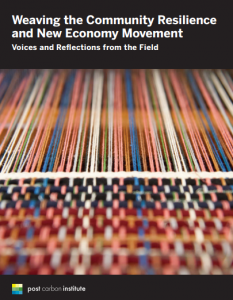 Based on what we heard during this six-month process, we wrote a 20-page report “Weaving the Community Resilience and New Economy Movement: Voices and Reflections from the Field” which offers “a portrait of a rich and vibrant movement” (including areas of alignment and tension within the movement) as well a vision of what economic transformation could look like in five years. If you’re interested in learning more about the state of the US new economy movement, or simply want to be inspired, give it a read! 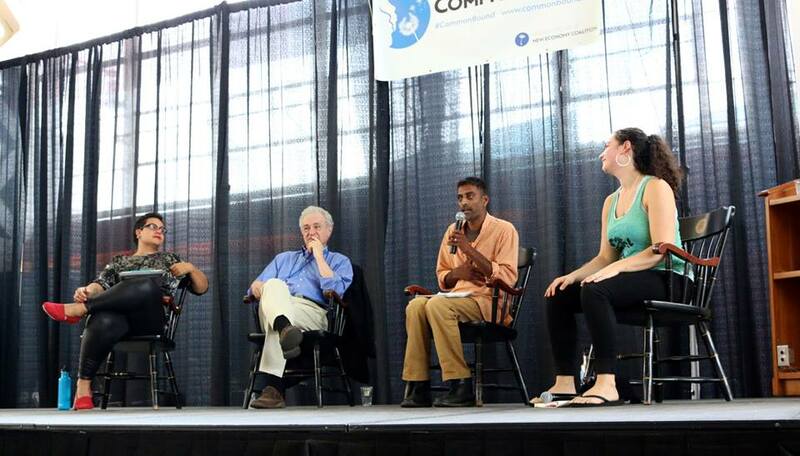 You can also read transcripts of the 18 interviews we conducted, including one with Transition US Co-Director Carolyne Stayton and one with Chuck Collins of Jamaica Plain New Economy Transition, a Transition Initiative in Boston. To me, a Dutch person, living in The Netherlands, it’s inspiring to learn more about the US lifestyle and those choosing to live in respect for freedom of lifestyle and in relationship with nature. Specially, in comparison with the attempts to implement the Agenda21. For this agenda uses the growing green global awareness as a means to veil the true purpose of it. To be more clear, in what I suggest here, go find the presentation by Rosa Koire on you tube, her explanation of Agenda21. I highly recommend that tubby!